Keeping a healthy, clean smile is key to preserving overall health. In fact, more and more research points to the connection between tooth and gum disease and higher risk of serious health problems, including heart disease. Along with regular brushing and flossing, a mouth rinse can help keep your teeth both clean and strong. If you have a toothache or your gums are sore, red, or swollen, consult your dentist. These symptoms can signal serious health problems that require medical care. Mouth rinses cannot take the place of regular brushing and flossing. Some mouth rinses are safe for small children to use, while others are intended only for adults and kids 12 years and up. Check with your dentist about which products are safe for younger children. Never swallow mouth rinses; supervise children who are using these products to make sure they don’t swallow them either. Many mouth rinses contain alcohol or a form of alcohol such as sorbitol or xylitol. These substances can be drying, so avoid them if dry mouth is an issue for you. Sorbitol and xylitol are toxic to dogs; even small amounts can be life threatening. If your four-legged friend gets into the mouth rinse, take him to the veterinarian immediately. What they are: Some mouth bacteria attack teeth, eating away at the enamel, which can lead to cavities. Other mouth bacteria generate foul odors contributing to bad breath, or cause inflammation of the gums, known as gingivitis. Antiseptic, antibacterial, and antigingivits mouth wash products are designed to kill these harmful mouth bacteria. These products may or may not contain fluoride. 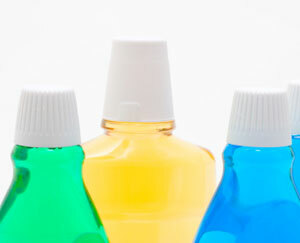 Why to buy: Antiseptic, antibacterial, and antigingivitis mouth rinses come in many different brands and flavors, and can be used before or after brushing to improve oral health. Many people feel that their teeth aren’t fully clean or fresh unless they use their daily mouth rinse. Things to consider: These products may worsen mouth dryness or cause stinging if you have existing mouth sores (canker sores or mucositis). What they are: Anti-cavity mouth rinses contain fluoride to strengthen teeth against decay. Anti-cavity rinses also may contain antibacterial ingredients, which are similar to or the same as some of the ingredients found in antiseptic, antibacterial, and antigingivitis products. Why to buy: If you live in an area without fluoridated water, an anti-cavity mouth rinse may help reduce cavity formation by supplying fluoride to the teeth. Also, home water filtration can remove fluoride from water, so if you filter your water, an anti-cavity mouth rinse can shore up teeth with fluoride. Anyone concerned about cavities may want to try an anti-cavity mouth rinse. Things to consider: Exposing teeth to fluoride through a mouth rinse is ideal—but never swallow these products, because ingesting too much fluoride can be bad for health. Overexposure to fluoride, especially during critical teeth formation that occurs between ages one and four, can cause a condition called fluorosis. Fluorosis results in discolored teeth and in severe cases, cracking and pitting of teeth. Fortunately, fluorosis results from ingesting (drinking) fluoride, not from rinsing teeth with fluoride solutions; anti-cavity rinses are safe as long as they are not swallowed. What they are: Teeth-whitening mouth rinses are designed to remove stains and lighten and brighten teeth. Common tooth whitening ingredients include carbamide hydroxide and hydrogen peroxide. Why to buy: If your primary goal is to whiten teeth, a teeth-whitening rinse is a good choice. Things to consider: Be realistic. A teeth-whitening rinse can effectively lift some surface stains from teeth, but it will not give you the dramatic results you’d see from a professional session at the dentist. Some people experience increased tooth sensitivity after using teeth-whitening products, so proceed with caution if you have a history of sensitive teeth. What they are: Combination mouth rinses contain a mix of ingredients that will address several mouth concerns at once, including whitening, cavity-prevention, and gum health. Why to buy: If you want an all-purpose, all-in-one product, a combination mouth rinse is a good choice. Things to consider: Combination products typically cost a little more than mouth rinses that address only one or two issues. If your mouth reacts negatively to an ingredient in a combination mouth rinse, it will be tough to know which one is the culprit. What they are: Dry mouth rinse products do not contain alcohol, which can dry the mouth further. They may contain soothing and moistening ingredients, such as glycerin, and enzymes designed to improve mouth moisture levels. Why to buy: If you have a dry mouth, one of these products can provide temporary relief and avoiding ingredients known to dry the mouth is a smart idea. Things to consider: Some dry mouth rinse products also contain fluoride or antibacterial ingredients and some do not. If cavities and gum disease are concerns, you’ll want a dry mouth product that does offer these additional benefits. This information was so useful. Thank you for clarifying issues I always wondered about. Glad to receive your very informative pages. Please keep up the good work.